The United States is comprised of fifty states and a national capital district, as well as a number of territories and possessions around the world. Because their names are commonly used and some of them are fairly long, they are often abbreviated in written documents and on mailing addresses. StateAbbreviations.us features a table of U.S. States, Districts, Territories, and Possessions, along with their standard and postal service abbreviations and their state capitals. Each State name contains a link to its official state government website. Each row of the State table also includes access to a state map. Each District, Territory, or Possession name contains a link to its official government or tourism website. 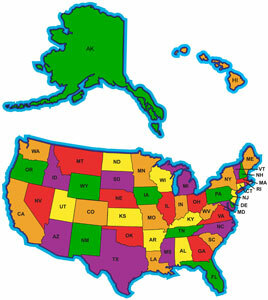 To find state locations, view the state abbreviations map, which shows the lower 48 states plus Alaska and Hawaii, as well as their two-letter postal abbreviations. Click on the illustration at right for a simplified view of the 50 states and their postal abbreviations. The standard, or traditional, abbreviations, were widely used on mailing addresses and in other contexts before the two-letter postal abbreviations were introduced. Use the standard state abbreviations, with periods and spaces as shown, for all purposes other than postal addresses. The United States Post Office instituted two letter state abbreviations along with five digit zip codes in 1963. These postal abbreviations should only be used in mailing addresses. When abbreviating the name of a state in a mailing address, use uppercase letters, with no space between the letters. Online Atlas for United States travel and tourism information. State Capitals for maps and info about each U.S. state capital. State Maps for printable road maps of each state in the USA. StateAbbreviations.us is a Chosen Sites™ reference source.